Konkan is located on the western coast of India and it has a long coastline area of 720 Kms. A part of this coastline falls in Goa and Karnataka as well but if you are concerned about the area of the coastline that falls in Maharashtra then you are at the right place as you will find the details of the process of checking the land record details on this page. There are many sub-district in Konkan area and you will also find different types of land in Konkan district of Maharashtra. Below are the details then you can find on Mahabhulekh Portal for Konkan and below is also the process to find the land records in Mahabhulekh. What are the Details Available via Mahabhulekh Portal? These details forms an important part of the land deal as this can help you in uncovering a potential fraud. Now, let us talk about the process to check the land records in Konkan district. How to Check Land Records in Konkan? You can either visit the district office to check the land record details or you can check them online. We are sure you would want to check them online so here is how you can do it. 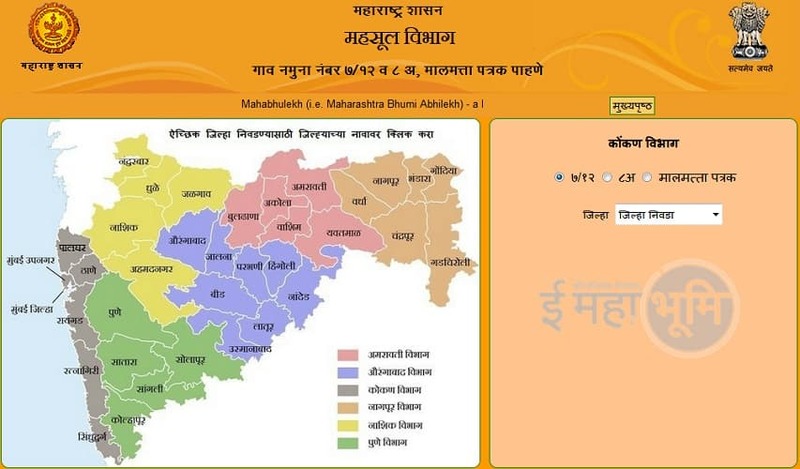 Visit https://mahabhulekh.maharashtra.gov.in/Konkan/Home.aspx and select Konkan from the right side of the page. This will redirect you to Mahabhulekh page of Konkan District in Maharashtra. Once you are on the page enter the sub-division, Tehsil and Village to refine the search results. This will take you to the next step where you can enter the search criteria for the land. The search criteria can be based on Akshari Number, Survey Number or the name of the owner. It is easy to find the same with Survey Number. You will now have the land records displayed on the screen. This was the process to check Mahabhulekh 7/12 land records in Konkan. For more information, you can get in touch with the district office in your area. Also check here 7/12 Utara Nashik. Next Post How To Check EWS Result 2019-20 and what to do After Selection?